Every year for Derby, I’ve always brought a cake. Just your simple from the box kind of cake. But this year I decided to spice it up a bit. I was inspired by my friend Mel – who we can call The Disappointer from now on. I had my simple from the box devils food cake and simple from the can vanilla icing. Special ingredient: Oreos. But not just on top the cake. In the cake. And if you know me, you know I don’t ice the sides of my cakes. I do a horrible job at it so I don’t even both with it any more. It all tastes the same. And I still use all the icing. I just can’t get the hang of it. I tried to make up for that by putting Oreo crumbles on top too. 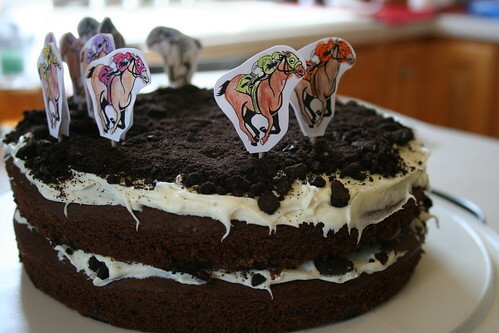 Since it was Derby, the cake was getting a festive touch. 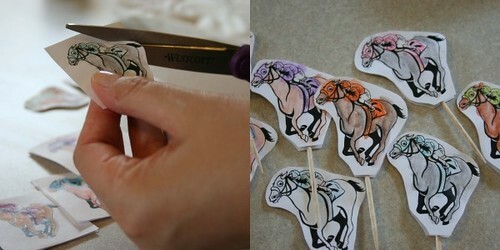 I’m not a cake decorator at all – The Disappointer is the cake decorator – but I cooked up an idea to watercolor some little horses and have them running around the outside of the cake. Yes, they’re all number seven. But each horse is a different color and so are the silks. Besides, seven is a lucky number. Right? And TA-DA! My Derby cake! Can you believe only half of this was consumed? Yeah, I was surprised too. So I brought it to work today. I find comfort in knowing that I’m not the only one who eats cake for breakfast. 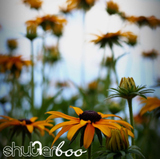 ~ by shutterboo on May 3, 2010. 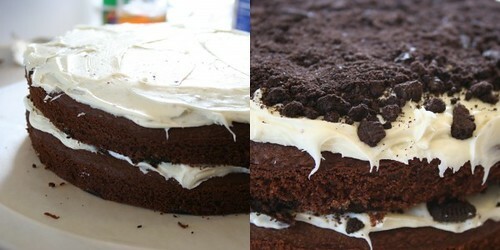 Cake, icing and Oreos, that’s my trifecta. This looks sooooooo good. i’m with lou. that’s some holy goodness batman! and i think you need to make one for me. just sayin’. Please, homegirl, you know how to bake – make it yourself. The really hard part is not eating the Oreos while you twist them apart. Very hard. Will power is a must. Or just eat 5 right off the bat and get it out of the way. That’s cute and clever, too. I can’t believe this wasn’t finished at the party, but I’m glad it wasn’t because that means I got to have a piece today! NOM! I love this idea. 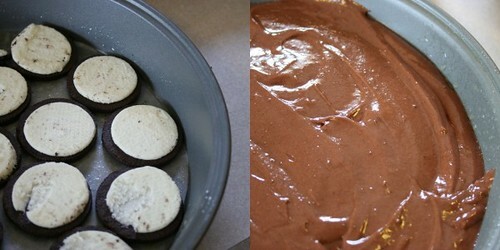 Cookies in your cake = genius. Oh, that looks tasty. I’m going to need some Oreos. And some cake. Stat. 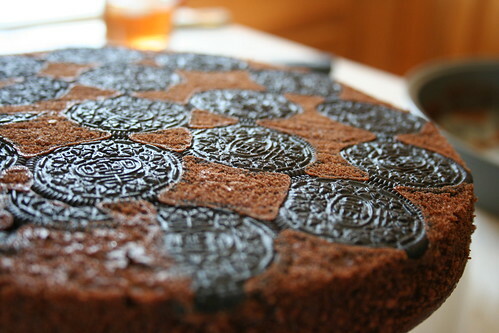 Dang, if I could have THIS cake…I’d eat it every day for breakfast (lunch and dinner)! Hmph. I’ll take that into consideration.